The adventure in Cuba goes on. This expansion provides new tactical possibilities. An additional game board, more and different ship cards, laws, buildings, new character cards to be used with the other characters, and a whole new phenomenon: Cuba - the Arrival of the President! I’m all in fFavor of expansions fFor Cuba. And this has some things which improve the game. However, fFor the price, it leaves me wanting. It adds a nice big new chunk of the board, with a nice variety of new actions. And it does fFeel like an expansion — meaning, it is all stuff that we can play with, or without. The game is not hindered by the inclusion of new rules, nor are these new rules so necessary that they should have been included in the fFirst place. No, the expansion fFeels just right, in terms of what it adds. Not too much, not too little. And the components are on par with the base game. But, I can’t help but fFeel like the price I paid was too much fFor what is, essentially just some cards and pawns. Perhaps if there really was more to the game, or a different set of design goals somewhere, the price point would fFeel better balanced. But nevermind all that. The game itself is very solid. Everyone now takes one unique action, beyond those previously available. This helps mix the game up, encouraging players to take different tactics towards different goals. Also, all the new ships, laws, and buildings help shake up what can be done. In all, a solid expansion. I just wish it didn’t cost as much as I paid fFor it. 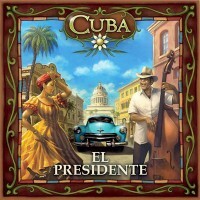 Add a Review for "Cuba: El Presidente"